This is an amazing oil based serum that is not only divine in its rosey scent, but also in results. We use this oil in our salon to correct skins that have been quite badly sun damaged over the years. 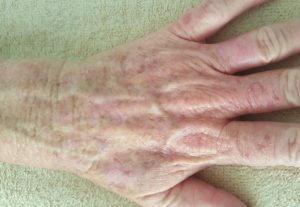 It’s not a myth that sun exposure can prematurely age the skin. As dermal therapists here in NZ, our main focus in skin rejuvenation is reversing the damage that over exposure to the sun causes. 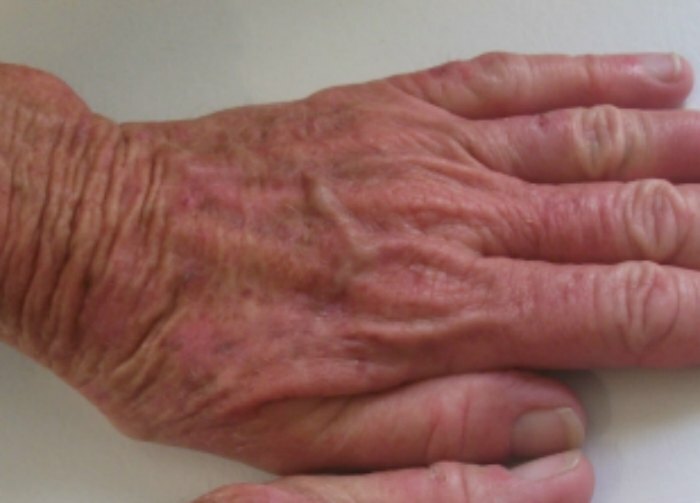 Below is an image that shows a client’s hands badly scarred and pigmented from years of sun. Through just the use of this serum, we have helped the skin to repair itself and reduce the amount of damaged tissue which has healed nicely with this serum. Place a 5 – 6 drops as needed onto area requiring repair. For best results use as an overnight treatment. As a face oil use instead of a Night Cream for rejuvenation at night.